Don't be a product snob! I used to be. To think of the products I missed out on because of the notion that "I only use organic/green/luxury/natural/beautifully packaged" products. Enough already. 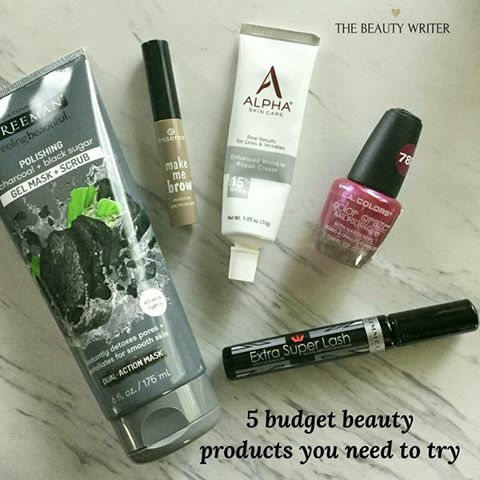 The drugstore, Target, Walmart, Amazon, and your local grocery store may very well just have some of the best beauty and skincare products you've ever tried. Freeman Polishing Charcoal + Black Sugar Gel Mask + Scrub -- If this product nixed the synthetic fragrance, it'd be near skincare perfection. I have tried so many charcoal masks, from Beautycounter and Origins to GlamGlow and The Body Shop and Posh. None are as good as the Freeman for just $3.27. Seriously. I have used this one for 2 weeks now and love it more each time. There are multiple skin-perfecting ingredients, including Kaolin, Banana Fruit Extract, Papaya, Raspberry, and more. It helps to pull out the "gunk" from your pores, but does so gently. It scores an A+ in my book. There are many amazing drugstore mascaras. I love Maybelline Full & Soft and L'Oreal Voluminous. Another tried and true was a repurchase of Rimmel Extra Super Lash. It had been more than 10 years since I last used it and I had a HORRIBLE budget mascara (Essence Beauty in black & mint green tube) that was the worst purchase ever in recent memory. I stumbled upon a two pack of Rimmel at Walmart for $4.47 & bought it. It's really lovely. Speaking of Essence Beauty, it's not all bad! While I didn't like the mascara, I love the Make Me Brow. It is a gel brow mascara and it is a great dupe for Lancome Modele Sourcils. I use it over my NYX Brow Sculpt & Contour. Another rave -- at Walmart, I found LA Color Craze Nail Polish. I bought shade 788. I had low expectations for this since it was $0.98, but it is actually pretty good. Well worth the buck and much better than other cheap polishes like Sinful Colors. It's not Essie, OPI, Butter or Zoya, but it is a great pedi color. Lastly, I have mentioned Alpha Skincare before. It's high end caliber, well-formulated skincare at an affordable price. I use their AHA cream daily and the Enhanced Wrinkle Repair Cream (.15% Retinol) at night. It is a great gentle retinol with an effective concentration for sensitive skin and at the right pH. It works. Try it!